The International Darwin Day Foundation has an online petition urging President Obama to recognize Darwin Day. If you think we need our elected leaders to speak out about the importance of scientific knowledge and its contribution to the advancement of humanity, and send a signal that religious infiltration into our science classrooms will not be tolerated, then please sign the petition. Darwin Day is an international celebration of science and humanity held on or around February 12, the day Charles Darwin was born in 1809. Specifically, it celebrates the discoveries and life of Charles Darwin – the man who first described biological evolution via natural selection with scientific rigor. More generally, Darwin Day expresses gratitude for the enormous benefits that scientific knowledge, acquired through human curiosity and ingenuity, has contributed to the advancement of humanity. 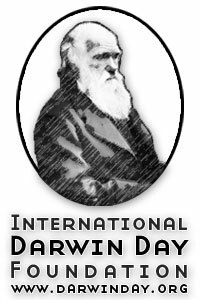 The International Darwin Day Foundation is a nonprofit 501(c)3 educational corporation, and its mission is to promote the public education about science and to encourage the celebration of science and humanity. The foundation needs your support in order to fight attempts to insert so-called Intelligent Design into our science classrooms, and to defend reason-based public policy in Congress. This entry was posted on 3 February 2010 at 10:28 am and is filed under Darwin Day, Science. You can follow any responses to this entry through the RSS 2.0 feed. You can leave a response, or trackback from your own site.